I hate to throw a seed away without giving it a chance. 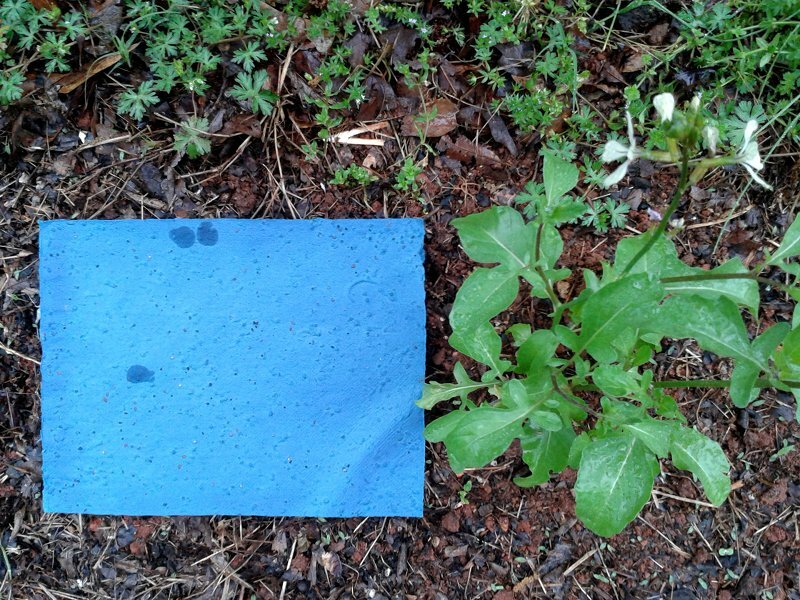 I once received a sheet of paper made with flower seeds pressed into it as part of a stewardship education resource. The instructions suggested that children could tear the paper into bits, press them into soil, water generously, and care for the flowers as they grew. I thought, “Come spring, my inner child and I will plant those.” But come spring, it was buried in a pile, and later landed in a file, where it spent about a decade. I totally forgot about it till one of our occasional spasms of file sorting and shedding brought it forth. “Those seeds won’t be viable,” I told myself. “That should go straight into the recycling bin.” But I couldn’t bring myself to do it. I didn’t want to commit valuable garden space to it either, so it’s been cluttering our home office. Nimue’s mother wisely says that when you give yourself only two choices, you don’t have a choice; you’re stuck. So I decided to re-frame how I thought of that sheet of paper. Instead of (probably) non-viable seeds or something recyclable, I called it compost. 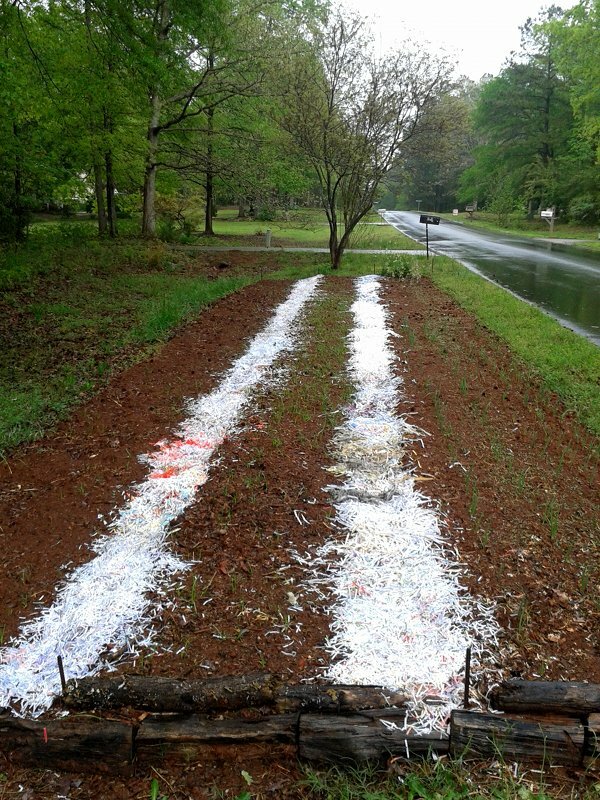 I tore the paper into bits, pressed them into soil, trusted them to the generous rain, and will accept whatever comes of it as good. Comments welcome … have you got anything that could use a new name to free it (and you) up? Jessica has a new bike! Actually, it’s an old bike … 37 years old, which is older than Jessica … “vintage,” if you like the term. But it’s new to her, so it counts. And this is the story of Jessica’s new bike. One day Jessica told her minister (whom she knew was an avid cyclist) about her late, lamented Fuji. She had no idea what an anticipation of satisfaction that set off in him. He had a quite tall Fuji himself, which he loved. But he wasn’t riding it, and felt badly it wasn’t getting used. For many years his “Fuji Steed” had been his only bicycle. Then he got a racing bike. He kept the Fuji, though, to ride to the store or on days when he didn’t want to bother with putting on cycling shoes. (Which are uncomfortable and look silly until they snap into the pedals that are their sole-mates.) All was well until he built up another frame into a commuter-and-touring bike. 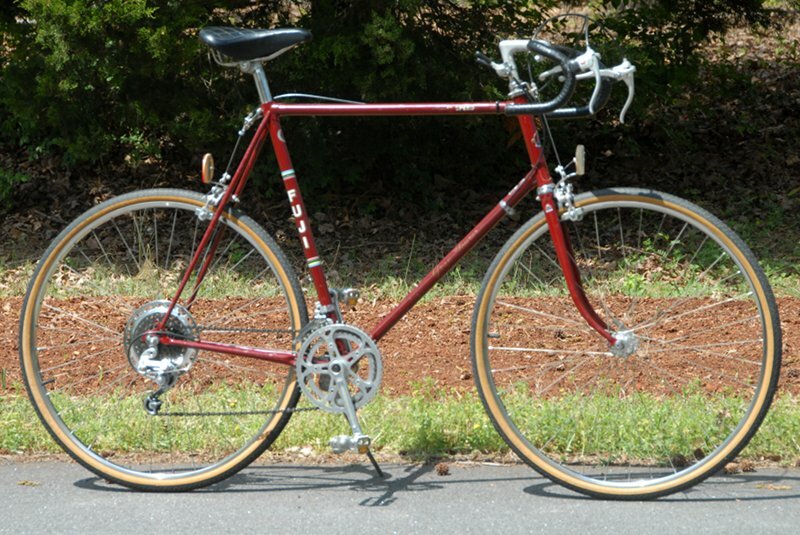 Then his purpose for the Fuji was lost … gathering dust in the garage doesn’t count as a use. In a crazy but harmless foible, revdarkwater is convinced that bicycles speak to him. (His wife Nimue might reserve a judgment about the harm or not, however, whenever he brings another stray home.) He felt the Fuji’s sadness personally. “I’ll offer the Fuji to Jessica!” revdarkwater thought. 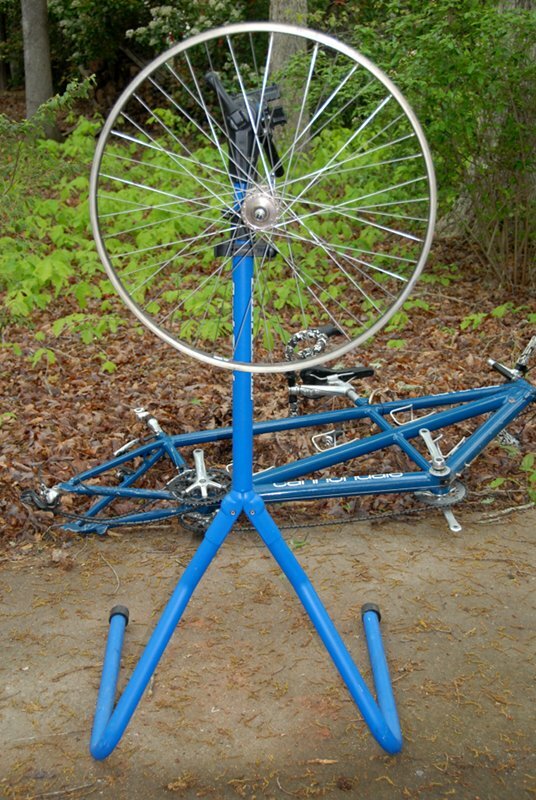 “But I want to fix it up right before I do.” The Fuji is thoroughly old-school; it has loose bearings in the hubs, headset, and bottom bracket, and they needed to be cleaned and re-packed with fresh grease. The finish had suffered the slings and arrows of outrageous fortune (well, it had had some bad luck, anyway). Finally, he had a horror of entrusting his friend Jessica to ancient brake cables. In short—tearing the Fuji down and building it back up took awhile. And they all cycled happily ever after. Comments welcome … does something that is yours, even something beloved, actually belong to someone else? Thirty years ago, I entered a pawnshop in Bloomington, Indiana, intending to buy a bicycle—not my first bike, but the first I purchased myself, as an adult. I’d decided I had to have a bike because my Pontiac’s transmission had shredded its innards in tiny shiny steel bits and the car looked to stay sidelined for at least a month. I spent $100 for a maroon Fuji. the best-looking of the mostly sorry lot chained to the bars over the windows. A couple years before I’d visited a local bike shop which sold Fujis, so I recognized the manufacturer’s name and reasoned it must be a good one. As ignorant as I was, I was fortunate in my choice (though I probably paid too much). 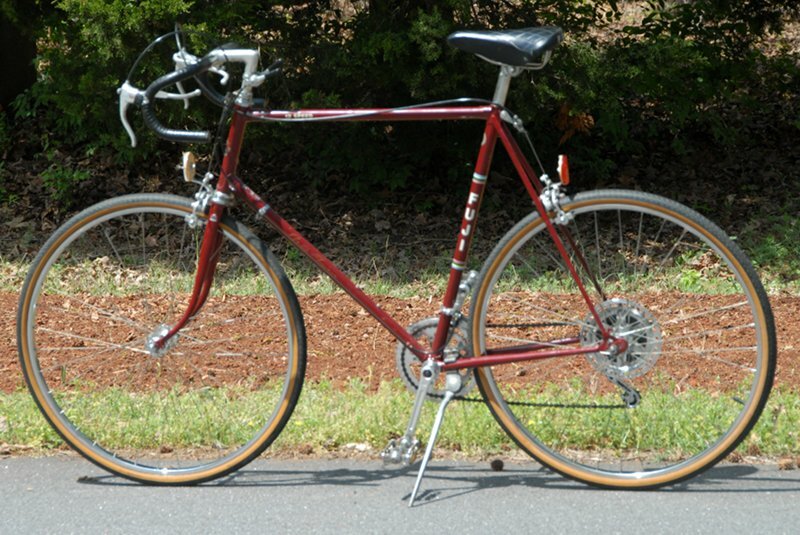 It was a Fuji Gran Tourer with a 25” frame (tall, as I am). 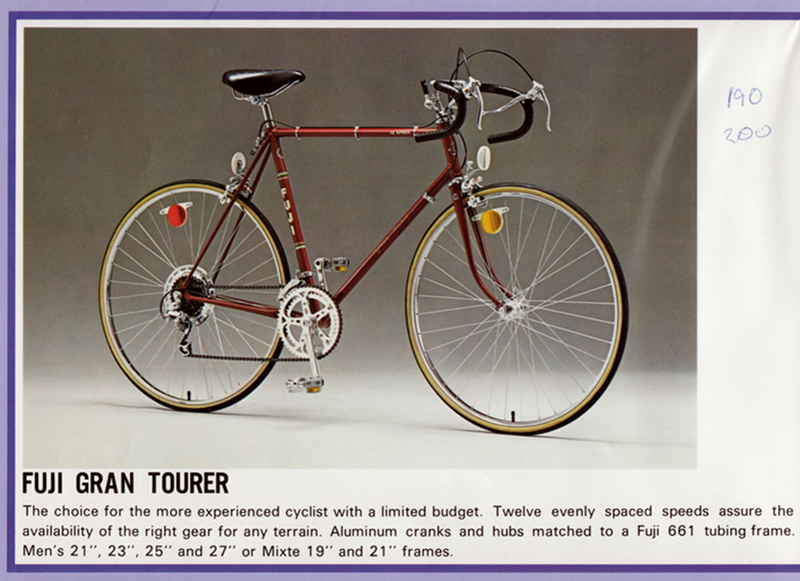 I know now that the Gran Tourer was a mid-level “sport-touring” model, aimed at casual riders who nevertheless wanted a fairly good bicycle. Mine was stamped with its serial number in December, 1977. The original dealer sticker is peeling, but I can still make out “Schoops Bicycle Sales” in La Porte, Indiana. They likely sold it sometime during 1978. I wonder sometimes about its first six years and how it came to the pawnshop. I’d grown up riding in southern Indiana on single-speed bikes with coaster brakes—had loved riding, but like so many North American males suddenly quit as soon as I got an automobile (or the car got me). So I had to check books out of the library to decipher the mysteries of derailleurs. Some of our first miles were a mutual struggle. But the bike got me into town to work and back to the farmhouse where I cooked and slept. A friend joked that it was my “Fuji steed.” The name stuck. When the transmission shop finally released my car, just three gears no longer enough seemed enough. I kept the Fuji Steed and kept riding it. When I left Bloomington for Chicago’s south side, I managed to stuff it into the Vega that replaced the Pontiac. I reasoned it would be easier sometimes to ride than find parking for the car. But really, I loved the promise of seeing the city from its seat—a promise both the bike and city kept. Down through years, wherever I moved, the Fuji Steed went too, and got me around my new home at least occasionally. But less and less as its condition deteriorated. I’d had to park it in damp basements and unheated sheds, and hard knocks took their toll. One day I realized the Fuji Steed wasn’t safe to ride. I told myself I’d eventually acquire the skills and special tools to make it right. For then, however, I just leaned it against a wall. Then another wall. Then another, as years passed … sad times for the Fuji Steed. Replacing the rotting tires, fitting new brake blocks, oiling stiff pivots and generally making everything serviceable cost as much as I’d originally paid for the Fuji, but it was worth every penny. We were riding again! I rode with David. I rode by myself. I rode with my associate Diane, who’d made cycling the foundation of her “get fit” program. We started holding our staff meetings on bicycle, and they instantly became more productive. —A happy ending, right? It’s coming. But not before a plot twist. Comments welcome … would you shed cliffhanger endings if you could?